Municipalities around the world, both urban and rural, face many challenges when dealing with the wastewater created by its population. These include; the processing of wastewater, cost of disposal of biosolids, finding environmentally safe disposal methods, onsite storage capacity and the ability to handle septic waste. For the last fifteen years the Geotube® dewatering solution has been providing municipalities with solutions for these concerns and more. Ideal for lagoon, tank and digester cleanouts, plus other applications. Dewatering and containment in one operation. 85-90% reduction of Biological Oxygen Demand (B.O.D) in effluent. Can be used seasonally, with solids safely stored onsite between uses. 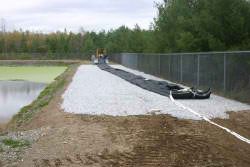 Dewatered solids can be disposed of in a landfill or can be land applied for nutrient enhancement. The nutrients can also be secondary composted for soil production, or used for methane production through an anaerobic digester. As populations grow so does the volume of wastewater municipalities must treat. With increases in total wastewater comes an increase in the amount of biosolids a municipality must dewater and dispose of. Many municipalities do not have enough on site storage capacity for biosolids, or have not devised a plan or solution to changing regulations. Many municipalities use lagoons to either treat or store their biosolids or septic tank waste. Lagoons eventually fill and require dewatering. 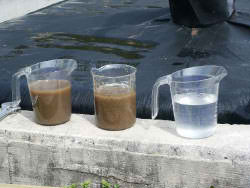 Increasing cost to treat and store wastewater are a high concern. Concerns of spreading raw septic tank waste are growing around the world due to harmful pathogens, odors, and health concerns. In some countries is already banned in both summer and winter months. 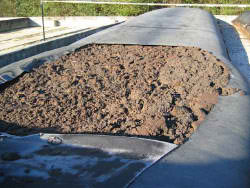 Most wastewater treatment plants are not equipped for the processing of septic tank waste as chemical loading may impact the plant. 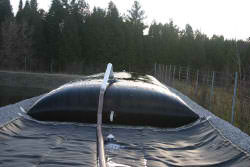 The Geotube® container dewaters processed biosolids very effectively and also can deal with raw septage. Solids pumped into the Geotube® container are typically between 1-5%. When removed from the Geotube® container after de-watering the remaining nutrients are often between 45-50%, therefore reducing the cost of disposal due to bulking. Municipal solids removed from the Geotube® container are treated as a nutrient not a waste. The fabric of the Geotube® container allows air to pass through, allowing natural microbial composting to take place inside the Geotube®. Geotube® technology reduces B.O.D by 85-90% and reduces harmful pathogens. It is a simple and passive dewatering solution. Mobilization of the Geotube® container requires very little labor. Setup is quick; the Geotube® container is perfect for permanent and emergency situations. Lagoon cleanouts are very effective with low capital cost and short time lines. No other dewatering technology in the world is as versatile as the Geotube® container. For more information, including case studies of past Geotube® technology dewatering successes please click here.